Happy Monday friends!!! I have no new news to report on my kitchen renovation, but I am happy that work is FINALLY being started. Yay!! And I had the most fabulous weekend with some of my besties in Malibu. Did you get to see my Instastories? Even though the weather was on the colder side this weekend in Malibu, it still is Spring. 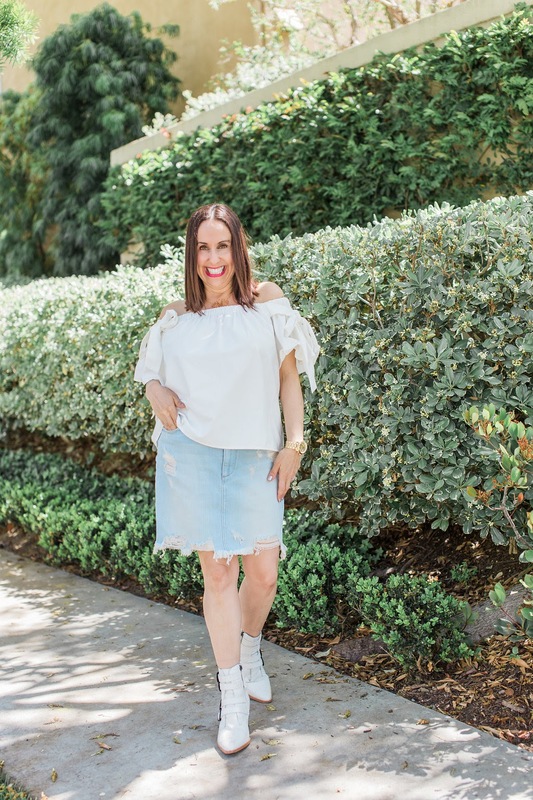 And one of my favorite spring looks is a comfy denim skirt. I love this one from Pistola. It is the perfect wash and so comfy. I paired it with my new go to staple, the off the shoulder top. This off the shoulder looks is so on trend right now. And can we talk about white booties? Every girl NEEDS a pair of these. Aren't they so fabulous? What are your favorite current trends? Let me know in the comments. Thanks to Gabi Wells for photos. You can shop this look by clicking on the links above. Happy reading!!! !